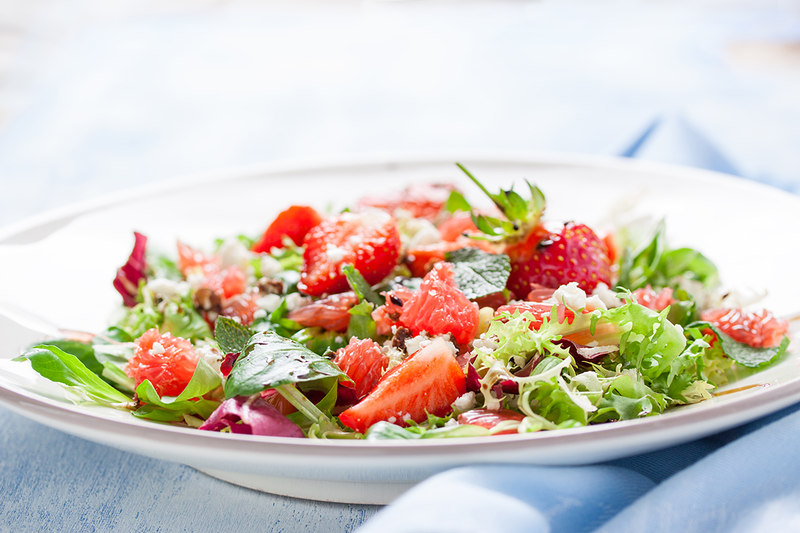 A lot of times we associate the word “salad” with health and weight loss, but is it really? That completely depends on what all you put in your salad and what type and how much dressing you use. Secondly, what veggies are you adding to it? Usually, vegetables are relatively safe to pile onto a salad. Red bell peppers, carrots, cucumbers, broccoli, tomatoes, mushrooms, and onions are all fair game. It’s usually the peas or the corn that you want to keep more moderated as those tend to be starchier carbs. Are you adding protein to it? Chicken, salmon, shrimp, turkey, and eggs are all great sources of lean protein that are great to add to a salad; of course, we would prefer the meat to be grilled though versus fried. Adding protein to your salad is vital because that is what’s going to fuel your body, give you more energy, and help you stay fuller for longer. What type of dressing are you using and how much? Of course, we all know that although ranch dressing is a favorite to most, it is one of the unhealthiest dressings you can use because of the high-fat content. Others that would fall into this same category include creamy caesar, creamy Italian, and bleu cheese. Usually, if it’s creamy, it’s a no-go. From a high sugar standpoint, fat-free honey dijon is one that you would want to steer away from. So what are some of the healthier dressings that won’t hinder my weight loss plan? Wish-Bone Salad Spritzer in Italian Vinaigrette, Wish-Bone Light Italian, Annie’s Balsamic Vinaigrette, Newman’s Own Low-Fat Sesame Ginger Dressing, or you could go with squeezing a lemon or lime overtop your salad or using olive-oil. Of course from the lemon, lime, or olive oil you will not get that needed fat content so I would encourage to include a source of healthy fat into your salad so that your body can properly absorb the vitamins, minerals, and nutrients from the salad. And remember too, it’s not just about what type of dressing you use, but it’s important to keep to the recommended serving size as well. For this reason, always ask for your dressing on the side when ordering a salad out. Take home points: Choose dark leafy greens for the base (not iceberg lettuce), pile on a rainbow of vegetables, add lean protein, and choose a small amount of a light or low-fat dressing on the side. You can also recommend this weight loss blog for health & fitness tips. Olivia Anna is a health and fitness blogger that shares informative articles online. and I would like to help people with healthy weight loss. You can learn more about Anna via his website at SweetFitnessHacks.